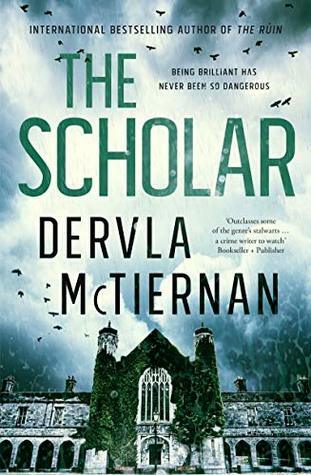 The second Cormac Reilly book by Dervla McTiernan, The Scholar, is a gripping read, a genuine page-turner that had me staying up into the wee hours because I simply had to finish it. Cormac and his scientist girlfriend, Dr Emma, have now moved to Galway where Cormac has been assigned cold cases and given the cold shoulder by his new bosses while Emma takes up a prestigious job in a pharmaceutical research company attached to the local university. 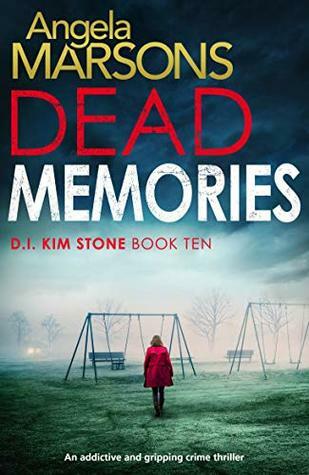 When a young woman is found brutally murdered on campus grounds, and Emma is the one to discover the body, it sets in motion a chain of events that have devastating consequences, not just for the victim’s friends and family, but for Cormac and Emma as well. McTiernan has done a marvellous job of expanding upon the primary characters she established in her debut novel, The Ruin, and introducing some new ones as well. She also uses police politics and procedures to give the reader insight into how various characters cope with not only the mundanity of the everyday, but the impact this, and the trauma of police work, can have upon families, individuals as well as the toxicity of certain personalities and their motivations in the workplace. 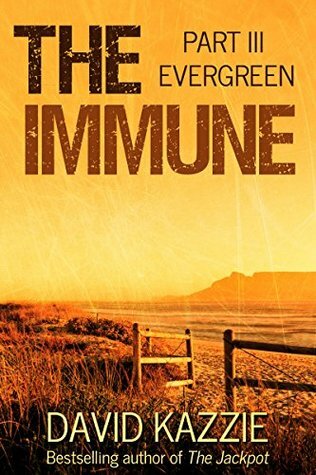 DS Cormac Reilly is a terrific character and his relationship with Emma is still finding its feet as she deals with the fallout of the past and he has to overcome his urge to protect her. It feels real as do the various issues they have that any busy professionals with psychologically and physically demanding jobs as well as emotional baggage could face. Not only does McTiernan create relatable characters you invest in (or even dislike intensely even while understanding why they might behave a particular way), but the plot is also given careful treatment. It is tight, totally believable and intense. I had to know how this book resolved itself and couldn’t sleep until I did – and then it kept turning over and over in my head. A fantastic follow-up to what’s already proving to be a sensational series. Cannot wait for the nest installment. Unraveling: The Immune Part One. I love eschatological narratives – you know, end of the world doomsday books. Films too. I don’t know what it is about them but maybe it’s the guilty pleasure and frisson that a good book or film can provide as the reader/viewer remains safe while the world they know unravels in print or on celluloid. Stephen King had a theory that this was why people love horror books and movie – that they’re revivifying; remind them of life by representing death. 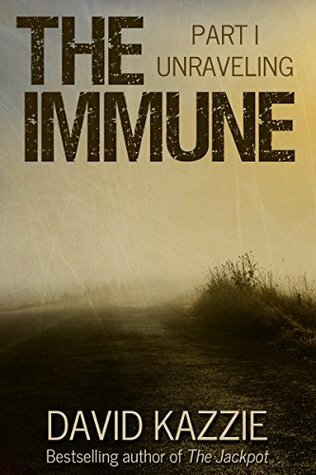 Whatever the reason, I enjoy this genre and Unraveling, the first book in the four part The Immune Omnibus is a really good, solid addition to the genre. The premise is the unleashing of a highly virulent disease by a mysterious group that wipes out the majority of the world’s population. Like many books in this oeuvre, the author chooses to focus on select but diverse individuals who, for some reason, are immune to what can only be described as a plague. The reader thus experiences the catastrophic consequences of this on their personal and professional lives, as society as they know it collapses and all they have loved and worked for and towards quite literally dies. Well written with strong characters replete with flaws, this is a good start to what promises to be a tight series. Already started the next one. 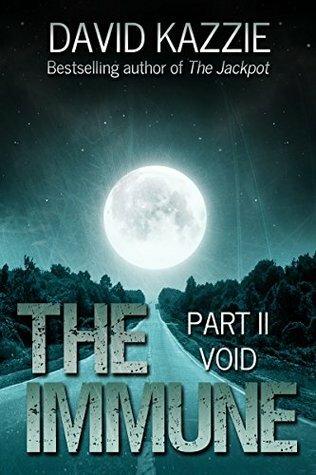 The second book in The Immune Omnibus, Void, is a fabulous sequel to the first book, Unraveling. Starting where it left off, Void follows the adventures of the survivors from the first book, namely the obstetrician, Adam, former footballer, Freddie, and soldier Sarah among others as they unite and trek across the USA, in search of Adam’s daughter, Rachel as well as answering the call of the CDC who, before the world went to hell in a hand basket, asked for anyone immune from what’s now known as the Medusa virus to come forward. As they travel, they meet others who have also lost everything. Joining together, the group learn not only how to survive and forage (including empty houses and abandoned businesses and vehicles) but about each other. Worst of all, they learn just how fragile the veneer of civilization is; how when there is no-one to enforce laws and common decency, there are those who will take advantage of the situation, regardless of the consequences. While the book is about a world in chaos, it’s also very much about the humanity or lack thereof of those now populating the planet and how survival isn’t just about nourishing the body, but also the heart and mind. Some good twists in the book and believable character development as well as fine writing made this reader buy the next book as soon as the last page of this one was finished. In this novel, Evergreen, our survivors of the Medusa virus, after another tragedy that shakes them to the core, settle in what appears to be a Utopia, the experimental township of Evergreen, a place that runs on solar energy and is fundamentally self-sufficient. Though ravaged by the virus, the remaining citizens welcome the travellers and it seems that Adam, Sarah, Freddie and Max have found a place to call home. But one person’s paradise is another’s hell and while some of the characters determine to grasp what happiness they can, there are those determined to destroy it, regardless of the cost or who they hurt in the process. I thought the pace might slow in this book with the primary characters finding a safe haven, but nothing could be further from the truth. Kazzie uses the static location as an excuse to explore the leads’ inner demons as well as expand the search for Adam’s daughter, Rachel. So we have on the one hand the physical difficulties of trying to start afresh while everything lost is still so raw, but more importantly, the psychological tensions the juxtaposition between the old world and those this new, stark and dangerous one create. How can anyone “move on” when the world as they know it has stopped? A page-turner that had me buying the next one immediately. The final instalment in this post-apocalyptic series is a doozy. The tensions and various narrative threads started in the other books not only come together but explode with shocking consequences. Just when you thought our intrepid and flawed characters had endured enough, Kazzie inflicts more pain on them and demands they rise to the occasion and show their resilience and instinct for survival. I don’t want to say too much more except that in every way this was a fitting end to the series and even if it doesn’t answer all the questions it raises, I think this is appropriate as well. 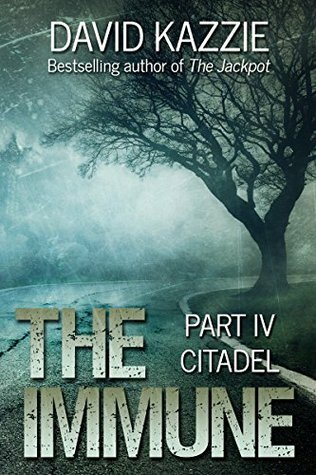 Well-written, fast-paced and action-packed, it was a great read. The second book in Horowitz’s series featuring taciturn and egotistical retired detective, Hawthorne, The Sentence is Death, is absurdly excellent. The story opens with divorce lawyer Richard Pryce being brutally killed with a bottle of expensive wine and the numerals 182 being painted on the wall above the body. Called into aid the investigation being undertaken by an unpleasant and bullying female detective, Hawthorne insists Horowitz accompany him so he might add this murder to the books the author is writing about him. For that’s the marvellous premise of these clever, humorous and beautifully plotted books: Hawthorne has persuaded an unwilling (or at least, against his better judgement) Horowitz to write what will be essentially biographical novels about Hawthorne, featuring his skills as a detective and the cases he solves. 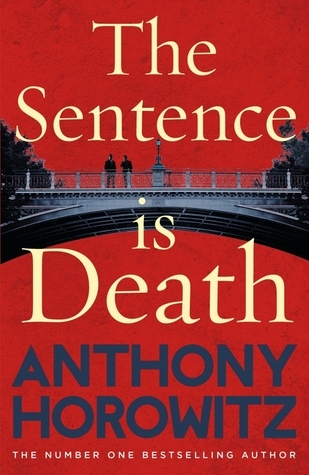 As a consequence, the author is a character in his own novel, presenting himself as a rather bumbling Watson-style character to Hawthorne’s Sherlock, becoming a very appropriate foil for the detective’s undoubted and oft infuriating brilliance. Suspects present themselves with alarming frequency in this case as not only Richard’s present and high-profile legal cases leave a trail of clues as to the culprit, but the past also proves fertile ground. Hawthorne and Horowitz have to pull out all stops and make, not only leaps of imagination but find facts to uncover the killer. Self-deprecating, frustrated and torn between professional curiosity and fury at the way he’s treated by Hawthorne and other members of the constabulary, Horowitz waivers between regretting his decision to write about Hawthorne and wanting to quit. Fortunately, he persists. This case has him (and consequently, the reader) hooked. Laden with references to real writers, actors and thinly veiled swipes and praise for others, as well as his own family and work Horowitz genuinely undertakes (such as writing the television series, Foyle’s War), increases the frisson the novel already creates. A clever, easy read that already has me looking forward to the next installment. For anyone who loves a great novel and especially those who love historical fiction and haven’t yet read a C.J. Sansom Shardlake book, stop what you’re doing now and grab a copy of the first, Dissolution. I only suggest that so by the time you get to Sansom’s latest, Tombland, you not only have a full appreciation of the imaginative scope and the character arcs in these novels, but also the historical backdrop in which these wonderful adventures featuring the intrepid and kind hunchback lawyer, Matthew Shardlake, are set. 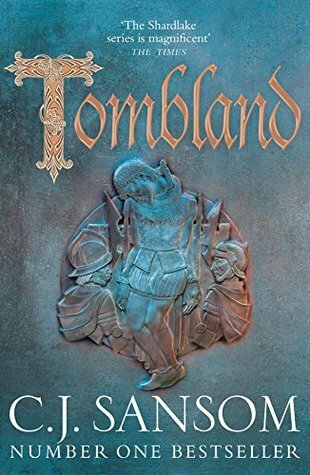 The latest in the series, Tombland, an epic at over 800 pages, is also an absolute masterpiece. Set two years after the death of Henry VIII, in the Spring of 1549 during the Protectorate and young King Edward’s reign, this novel follows Matthew and his assistant Nicholas, as they’re called to investigate a distant relative of young Princess Elizabeth (recently involved in a shameful incident with the former queen’s husband, Thomas Seymour), who has been accused of murder and is imprisoned in Norwich. Elizabeth has no desire to be openly involved, but is determined to get to the truth of the accusation and help a family member. Left with no choice but to obey the unusual request, Shardlake and Nicholas head north-east, keen to get out of London, if not to become embroiled in royal antics and politics anymore. However, they assure themselves that the case doesn’t appear complicated and they shouldn’t be occupied with it for too long. Naturally, we know they’ve spoken too soon. Not only is the case involving John Boleyn far more complicated than Shardlake first hoped, but while they’re preoccupied with proving John Boleyn’s innocence, East Anglia erupts into violence as a peasant rebellion lead by a landowner, Robert Kett, begins. The more Shardlake tries to stay remote from the peasant rebellion, the more he and his friends are drawn into it, including Barak (who is in the area for the assizes). Witnessing great cruelty, corruption, bravery and kindness, Shardlake is tested in so many ways. Not only is his loyalty to king and country put on the line but that to his closest and dearest of friends as well. Shardlake quickly learns that being a lawyer and gentleman can be more dangerous than he ever would have believed. Set against the backdrop of a genuine and little-known rebellion, and at a time when the English currency was debased, inflation on the rise and the English people suffering the catastrophic effects of an ongoing war with Scotland and France as well as poor harvests, by injecting Shardlake into a relatively obscure part of English history, Sansom has brought it to life in such a majestic and yet devastating way. Through Shardlake’s eyes, we see the desperation, suffering of the English poor as well as their blind faith in their king to do the right thing by them. The way in which they felt they’d no choice but to rebel and even so, did all in their power to adhere to a code of conduct that would impress their sovereign, is heart-wrenching. So are the consequences of their actions. Whether it’s intimate scenes between friends, or an interrogation that Sansom writes or sweeping battles, the reader is in the heart of the story and it’s an aching one that leaves you wanting both more and less. Having said that, I couldn’t put this book down and I didn’t want it to end either. Shardlake’s world, while cruel, contrary and riddled with injustices, is also rich and fascinating. Moreso, because we are guided through it by one of the best characters in historical fiction today – the ethical and compassionate, wise and good-humoured, self-reflective Shardlake. Sansom’s PhD in history really comes to the fore here as he uses – not just history, but a sense of its continuity and relevance to today, inviting us to immerse ourselves in the moments, all of which propels his story along. As a bonus, readers are treated to an essay on the actual events from Sansom at the back of the book and it so worth reading. There is also a recommended book list and sources. I loved discovering how and where he used actual events and people in his tale and where he inserted Shardlake – who, despite being fictional, appears seamlessly. I cannot recommend this book or series highly enough. I can’t even say these books get better and better because they’ve always been of such an impossibly high standard – and in Tombland, this has been more than maintained. My only disappointment is I now have to wait (im)patiently for the next one. A tremendous read – inspirational, unforgettable, entertaining and educational. You can’t ask for much more.